This is the last week of the course and we have saved a key topic for this week: evaluation. During this week you will identify commonly used methods of evaluation and review existing evaluation tools. You will finish the course by discussing your own experiences of ocTEL. This is not only about you and the course, but also about how we can make things better next time round. As you know, the course was designed, written and largely supported by Members of ALT (see who’s who on our ocTEL team page) and your feedback can make a big difference to how we develop and run the course in future. Thus the evaluation also has a clear aim to learn from the experience of designing and delivering a MOOC, and to make use of this to inform future ocTEL cohorts. While we could not implement a formal accreditation mechanism for the course this time, we are working towards mapping the course against the criteria of CMALT (ALT’s accreditation scheme) and the UKPSF as well as evaluating Open Badges as a way for future participants to gain recognition for undertaking ocTEL. 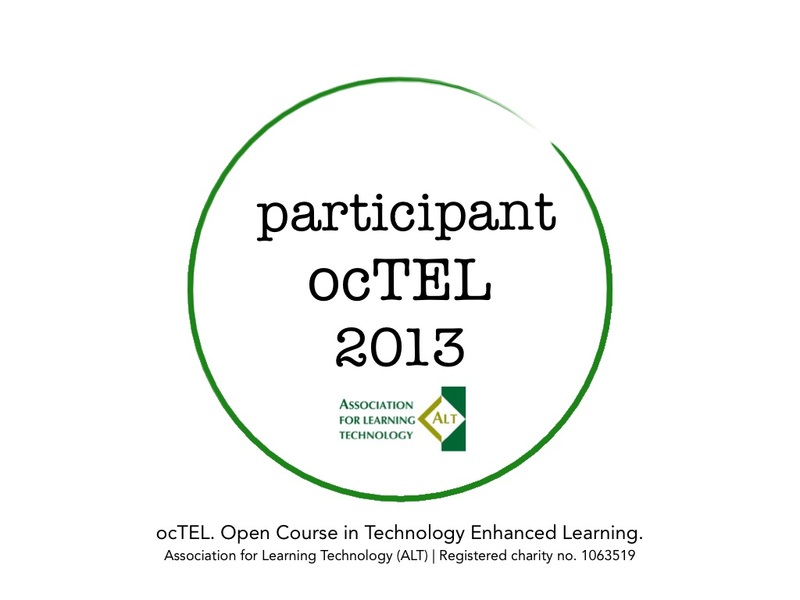 Use the ocTEL badge image online. The certificate and the badge will be available via the ocTEL site at the end of the course. How can I evaluate my TEL project/course? What are the most effective tools for evaluation? Evaluation is a key part of the project life-cycle, but often gets forgotten or given only a light touch. Considering a TEL initiative you’ve been involved with, how did you know it had been successful or provided benefit? Was the initiative evaluated? If not, why not? If yes, what evaluation took place, what did you and your stakeholders need to know and how were the findings used? Using the headings below (either in a list or as a table) reflect on the different ways you have come across for evaluating the effectiveness and impact of TEL. What are the advantages and disadvantages of each approach? Read Evaluating Technology Supported Learning from Edinburgh Napier University. Compare the methods you have identified with what the authors have suggested. Share your thoughts on your blog or via Twitter (using #ocTEL tag), on this forum topic, or via the JiscMail list. The webinar runs from 12:30 to 13:30 British Summer Time on Thursday 20 June. You can access it from 12 noon onwards via this link. On your blog or via Twitter (using #ocTEL tag), on this forum topic, or via the JiscMail list, share an instrument or tool that you have used to evaluate and measure impact and provide a short critique on its effectiveness. Read and comment on entries from two or three other participants. If you developed a case study in Week 9, add in a section on how you evaluated the effectiveness and impact of the project, and re-publish the case study. If you have not developed a case study, you can use a different example instead. Activity 10.3: What do you think about ocTEL? We started the course 11 weeks ago by thinking about one big question and we hope that you have kept in mind what it was for you. As part of the final activity for the course, we’d like to encourage you to revisit your ‘big TEL question’ and see how your view of it has been changed and reframed by the course (and indeed whether it it still the same!). Share your thoughts on your blog or via Twitter (using #ocTEL tag), on the original forum post if you made one or this forum topic, or via the JiscMail list. We also recommend that you take a bit of time to look through the weeks and bookmark or otherwise keep a record of the best bits for you. What is most relevant for your practice? Which resources could you use or re-use? The materials for the course including the recordings of live sessions and the forums will remain on the ocTEL website so that you can refer back to them later, if you are missing something. As we mentioned in the introduction to this week, we are seeking your feedback on any and all aspects of the course, including its platform, delivery, content and format. Completing the evaluation should take approximately ten minutes. Have a look at what’s next and keep in touch! ocTEL alumni: As an ocTEL alumnus we want to keep in touch with you and spread the word, so do keep in touch! Formative – carried out by members of the course team for the benefit of the course team as a way of identifying revisions and improvements. Summative – carried out by an external auditor intending to provide judgement about whether a project has met its aims or a course has met its learning outcomes. Illuminative – an approach which seeks to understand the perceptions of the participants in terms of what is important to them through phases of observation, inquiry and explanation. Integrative – a combination of the summative and integrative approaches. Once you’ve decided the type of evaluation it’s important to consider the following aspects of the evaluation cycle, from defining aims, through data collection and analysis, to drawing conclusions, and reflecting back on the aims. For more information about the evaluation cycle see Embedding Learning Technologies – Evaluation Cycle (pdf).